Nearly ten years after it was first created, the Framework Curriculum for Integration Courses in Germany has been revised and published in an updated version. It was not a question of fundamentally revising the framework, but of bringing it up to date to reflect the different groups of participants attending the courses, increasing relevance to the world of work and incorporating values relating to social coexistence to a greater extent. 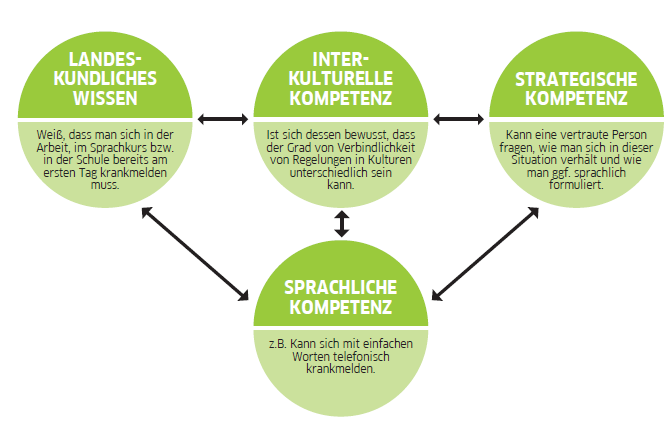 Structure of the Framework Curriculum for Integration Courses | © Framework Curriculum for Integration Courses 2016, page 17 Learning goals relating to both language proficiency and knowledge of Germany and its culture are defined within these areas of general communication and specific fields of activity. This curriculum provides a framework, and thus a maximum catalogue of learning objectives: not all of the learning objectives, and not all of the learning content, have to form part of an integration course. First and foremost, the Framework Curriculum is targeted at those who compile examinations, textbook authors and course planners, as well as anyone else who may be interested. However, it also provides a useful orientation for teachers of German as a second language. Further information about the original creation of the Framework Curriculum can be found in the article Organising integration – Company framework curriculum. In the nearly ten years that have passed since the Framework Curriculum was created, the legal situation has changed considerably, as has the structure of immigrant groups and their needs, not to mention the expectations that society and politicians have of immigrants. Against this backdrop, the Federal Office for Migration and Refugees (BAMF) commissioned the Goethe-Institut in 2016 to update the Framework Curriculum. It was not a question of fundamentally revising the framework; given the changed group of participants, topics relevant to the world of work and values of social coexistence were merely incorporated to a greater extent. Two major groups in particular deserve to be mentioned in the context of the changed group of participants: for one thing, increasing numbers of people from EU countries have been coming to Germany since 2011. And for another thing, over one million asylum seekers and refugees came to Germany in 2015, many of whom will remain in the country for an extended period and thus represent an important group of participants in the integration courses. In this context, the circle of those entitled to attend an integration course was expanded to include those people with a temporary residence permit, provided that they have good chances of being allowed to remain. The preamble of the Framework Curriculum in particular as well as all other sections were revised to take account of these developments. To incorporate topics relevant to the world of work to an even greater extent in the Framework Curriculum, three thematic fields of activity in particular were updated and supplemented by further learning objectives: work, job-seeking and training and continuing education. In addition, all other sections of the curriculum were reviewed with respect to these topics, and adapted slightly where necessary. The idea is to pave the way for immigrants to find a job or begin a suitable course of training of continuing education as quickly as possible. The revision of the Framework Curriculum with a view to more firmly anchoring values of social coexistence is based on Germany’s constitution and its General Equal Treatment Act. Accordingly, the areas of general communication were expanded to include the upstream modules of Diversity and Interculturalism and Country and Culture. These, and the new learning objectives that have now been added to the area of country and culture, were not to be found previously in the general areas. Expanding areas of general communication | © Framework Curriculum for Integration Courses 2016, page 29 In addition, the entire document was revised and updated to accentuate social values to a greater extent. Within the specific fields of activity it was above all the learning goals relating to country and culture and intercultural aspects that were expanded. Interculturalism was extended to include the aspect of diversity. Because value-based political and social educational goals have been included and the learning goals in the area of country and culture have been expanded, the Framework Curriculum now constitutes an even better preparation for key aspects of the orientation course. Nonetheless, it continues to define only the learning goals of the language course. The curriculum for the orientation course has been separately revised by the Federal Office for Migration and Refugees (BAMF) and published on its website. For example, course participants are already sensitized to values inherent to basic rights during the language course. Consequently, the language and orientation course are thus even better coordinated in terms of the way they introduce participants to the basic principles of openness and tolerance in interpersonal dealings. At the same time, this creates a “test lab” for social participation. Andrea Hammann and Isabel Graf work on the “Migration and Mobility” project at the Language department at the Goethe-Institut’s headquarters.